Family is everything, isn't it? After all, I'd be nothing without my mother's love and my father's devotion, that's for sure. And I'd go very hungry indeed if it wasn't for the presence of my Sicilian uncle in my life. Without him, I would have never known the pleasure of tiny cockles stewed in tomato sauce and eaten with a toothpick on New Year's Eve, or the glory that is a perfectly stuffed and battered fried zucchini flower. I ate my first raw oyster at his behest (though it didn't exactly - er - go down as it should have, and the humiliation of that moment still stings a bit), consider my best spaghetti dinners to be the ones that I learned by watching him (and, by extension, my aunt - who is no Sicilian, it's true, but a gifted cook and exacting taster nonetheless), and I still know absolutely no one who can clean artichokes as well as he can and perform the kind of culinary magic with them that he's capable of (fried, braised or stewed - they are incredible). Now that the rigors of adulthood and certain geographical realities prohibit me from seeing my family as often as I'd like, the wonder of email and the Internet keeps us linked even when we cannot be together. So when my Sicilian uncle read that I'd finally found Giovanni Rana's pasta around the corner here, it reminded him to tell me about his latest discovery. Aren't you glad I'm the generous, information-sharing type? It was Pasta Setaro - an artisanal pasta made in Campania and sold (oh so luckily!) right around the other corner here, at Buon Italia. I hided myself over to get a kilo of penne and a wedge of imported ricotta Romana for the dish I'd been eager to make for years, since I first spied it in the New York Times Magazine, in a profile of Sara Jenkins (chef and daughter of Nancy Harmon Jenkins). Sara has you boil pasta while you wilt pungent mustard greens in olive oil and slivered garlic. When the pasta is cooked and the greens are sufficiently wilted, you stir a goodly amount of ricotta into the greens, off the heat, and add the drained pasta. A plentiful shower of Parmigiano tops the dish. If you've never had sheep's-milk ricotta, trust me when I tell you that there is absolutely no way you can substitute the supermarket version here. You'd be disappointed in the mediocrity of the dish and you'd resent me. 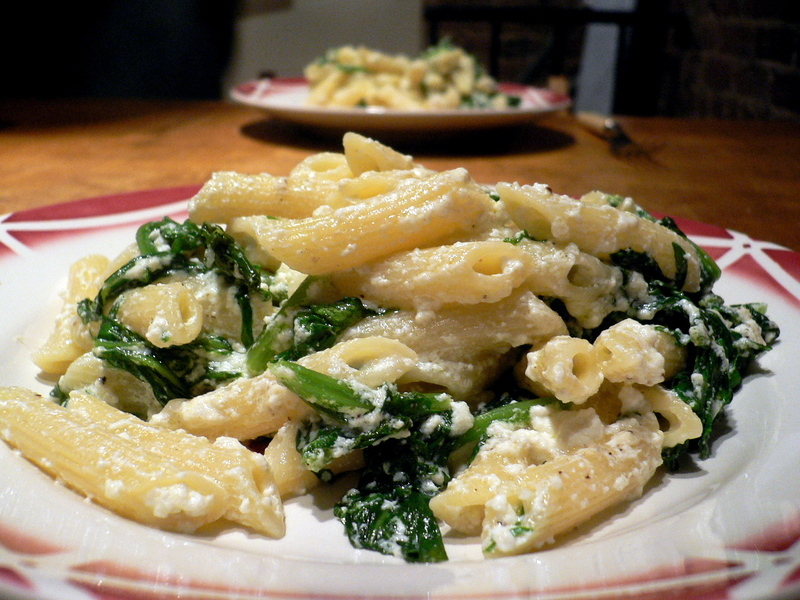 Do your best to find imported ricotta from Italy for this recipe. I'm not sure it's worth trying with anything less. Living so far away from people I love is no picnic. But it is a deep, abiding comfort to find their presence so readily in my home when I get into the kitchen to cook the way they taught me to, with the ingredients that flavor their lives and my own. In a month, I'm taking Ben with me to Italy to see my family and show him the (real) tastes of home. I am counting the days and I know he is, too. 1. Bring a large pot of generously salted water to a rolling boil. Add the pasta and cook until tender but firm at the core, about 8 minutes. Meanwhile, heat the olive oil in a large saute pan. Add the garlic and cook until golden. 2. Add the mustard greens and about 1/4 cup of the pasta cooking water, just enough to steam the greens. When only a little liquid is left in the pan and the greens have wilted, remove the pan from the heat and add the ricotta, stirring with a wooden spoon until the cooking liquid is removed. 3. When the pasta is done, drain it, add it to the sauce and fold everything together. Sprinkle with a handful of grated cheese and fold together again. Season to taste. Serve with more grated cheese on the side.